Big, buzzing insects are sure to disturb any outside party, but any kind of wasp is like Godzilla terrorizing your outside area! Hornets are not the type of guest you want crashing your time enjoying the outdoors. While they’re not prone to being confrontational with people, it’s easy for a hornet to get the wrong idea and mistake you for an enemy, causing them to attack. 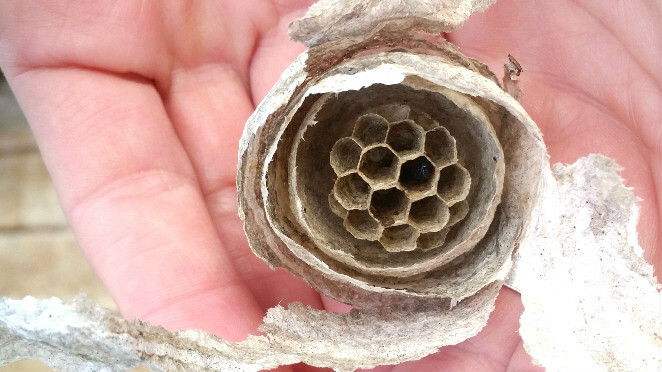 A hornet’s nest is made from a paper substance, created by mixing wood fibers and saliva. Unlike their yellow jacket cousins, they like to make their nests above the ground. Trees and shrubs are common places, and they’re even known to make a nest in places like a home’s eaves! Their nests begin with the queen (defined as a mated female) being the sole occupant who makes combs to deposit her larvae. Once the worker hornets (asexual females) begin to hatch, they’ll take over the responsibilities of making the nest bigger and finding food. The only role males have in the nest is to mate with the queen; most die after doing so. The queen who starts the nests comes out from hibernation in the spring time. During the winter months, queens will survive by finding protected areas, such as under tree bark or attics and crawlspaces. Once she begins to lay her eggs, she will continue to do so throughout the entire summer. At the end of the summer, the new queens will find their own places to hibernate, leaving the old queen and the rest of the nest to die; the new queen will emerge for spring to begin the cycle again. While hornets feed off of tree sap, they’re also very fierce predators and consume other insects, such as flies and bees. 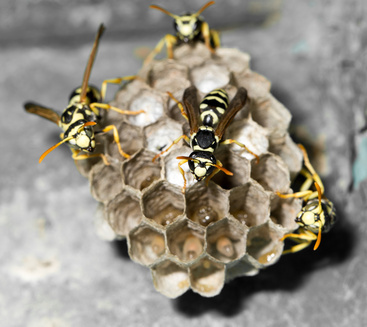 Hornets are capable of aggressively protecting their nests, especially when they feel threatened. Their sting is painful, but typically their venom is only dangerous to someone who has a preexisting allergy to them. If you are stung, your best course of action is to run away and not swat at it! Hornets leave behind pheromones with its sting, and mark you as an enemy to the nest. If other hornets pick up the scent, which they’re able to do in great distances, they’re liable to swarm, which can be hazardous. They can also emit a similar scent during the distress of being killed, so avoid doing so unless you know the nest is far away. Thankfully, they only attack out of self-defense or when out hunting, so it’s best to leave them alone if you come across them.